Glorious Layered Desserts Cookbook GIVEAWAY! I am so excited to offer this giveaway to you today! It’s for (easily) one of the most gorgeous cookbooks I’ve ever seen, and it happens to be authored by one of my good friends, Glory Albin of the ever-popular blog, Glorious Treats! Glory and I met last year and realized we lived super close to one another. She is as every bit as sweet in person as she is online, and her homemade treats, cookies and confections are always stunningly gorgeous and TASTY, too! Glorious Layered Desserts is a modern take on traditional trifles. Glory has single-handedly mixed and matched ingredients and flavor combinations to create truly unique, gorgeous and delicious layered desserts for any occasion! 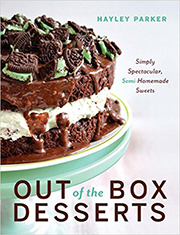 The first half of the book consists of the one-of-a-kind layered dessert recipes — things like Nutella and Banana Trifles, Cookies & Cream Cheesecake, and Brownie Strawberry Shortcake, to name a few — and the back of the book features the “Essential Recipes”, the from-scratch base recipes for all of these fantastic desserts, like her Creamy No-Bake Cheesecake, Chocolate Mousse & Vanilla Pastry Cream. These scratch-made essential recipes will help act as your building blocks to creating her stunningly beautiful, seriously scrumptious desserts. A lot of the recipes can be made in under an hour, and a good handful of them have sugar free, gluten free & egg-free options as well. My favorite part of the book (besides the insanely droolworthy recipes)? I LOVE that each recipe (even the Essential Recipes!) has a beautiful color photo. When I’m browsing through cookbooks, sometimes I’ll find a recipe that sounds awesome but it is hard to picture it in my head — either how it would look execution-wise, or finished-product-wise. Glory makes staging and set-up easy with clear photos that show you exactly how to layer and display each tempting treat. So if YOU would like to win your very own signed copy of Glory’s new cookbook, Glorious Layered Desserts, just answer me this question in the comments section: what is your favorite flavor of pudding/mousse? Chocolate? Coconut? Classic vanilla? I want to know! One comment per person, please — I’ll select a winner randomly on 4/19 and notify them as soon as possible. 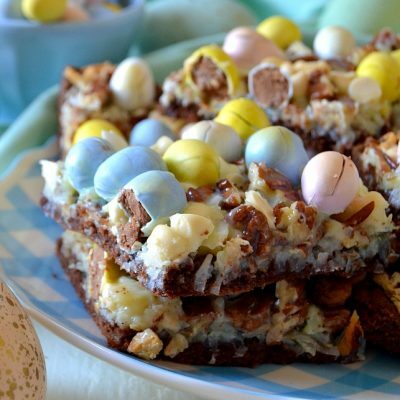 In the meantime, feast your eyes on these gorgeous photos of some of Glory’s tastiest layered treats from her book! Good luck, and thank you for entering the giveaway! Be sure to check out Glory’s blog, Glorious Treats, for more incredible recipes and more info on her book. 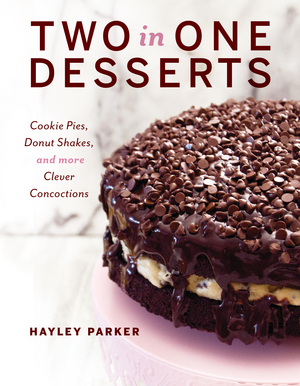 You can also purchase Glorious Layered Desserts on Amazon and at major bookstores. I was generously provided with a copy of Glory’s book to review for this post, as well as a book to give away to one lucky reader. I was not compensated for my time or opinion, and all opinions are 100% my own. Can’t wait to check out her blog… They all look amazing!! Oh my goodness, it is coconut with chocolate, does that count. I love them together and layering is so important! That way you just slide your spoon down the side and get everything in one bite. I love that idea. I just made Macarons with caramel and toasted coconut filling!!! Wooohooo! I would LOVE a signed copy of Ms. Glory’s new cookbook. That would be a first time I have not had to buy a cookbook. How cool is that! I love my cookbooks and this one is a real treat. Keeping my fingers crossed that this will be the one time in my life that I win something. This is very important. Thank you for sharing this giveaway!! The book looks great!! I wanna try EVERYTHING in it haha..Thank you for the chance to win! Have a great weekend! I love good oL’ Vanilla pudding, heavy on the vanilla and sometimes just a touch of malt flavoring. The recipes on the book look scrumptious. I have always liked real “true to flavor” coconut puddings. My favorite flavor of pudding would have to be coconut. I just love coconut anything! Lemon! It is the best flavor EVER! I love Key Lime Mousse. Chocolate with a little something extra like raspberry, mint, coffee, or peanut butter! Peanut butter and chocolate swirl. Chocolate pudding or chocolate mousse was/is my favorite flavor. When I was a kid we had Cool Whip in the house. Cool Whip and chocolate pudding, along with a graham cracker or two is quite tasty! Chocolate!! It is the best! Chocolate. Definitely chocolate. Plain. Dressed up. Dirt and worms. Layered. There is something so wonderfully perfect about chocolate pudding. My favorite would have to be chocolate… Yum! Thanks for offering this giveaway Hayley! Not many flavors of pudding i do not like . But i love butterscotch. Lemon pudding. Always reminds me of summer! My husband says Butterscotch – I say Vanilla. It has to be Carmel–with a touch of chocolate!! Pumpkin Mousse with Vanilla Wafers for a crunch! Pistachio is hands-down the best pudding flavour. My favorite is actually a TIE – between Lemon and Butterscotch. Chocolate! Chocolate! Chocolate! I’m a bit of a chocoholic. Mocha! A smooth blend of chocolate and coffee can’t be beat! I really like strawberry – with real strawberries on top! I like the classic banana pudding with Nilla wafers and whipped cream! Favorite flavor would have to be chocolate! I love vanilla pudding and chocolate pudding and rice pudding and basically all pudding. Now I want pudding! My favorite is butterscotch. It is awesome when I am making my soft pudding cookies. Put peanut butter morsels in it with cream cheese frosing and wow! My favorite flavor of pudding is chocolate. Why does everything layered look so pretty?! I need this book so I can be inspired by pretty, colorful layers! My favorite pudding is caramel…mmm caramel! I love some classic vanilla pudding! Gotta start gathering recipes again! Chocolate…no wait, pistachio!! well, banana is yummy too, I like vanilla also and you can’t forget cheesecake… does a person have to have just ONE favorite?? that’s like a favorite color….there’s too many to choose from and I like most of them the same!! LOL just be thankful you’re not standing behind me at Baskin Robbins as I’m trying to decide what flavor!! Love Chocolate!! Love your site! Definitely chocolate, but it’s got to be piled with whipped cream, too! My favorite pudding has always been tapioca. Although, I’m a sucker for any homemade pudding, still warm. I would have to say if it is straight up pudding; Vanilla or Pumpkin…but then again if it is in the shape of a pie then it is Banana Cream or Chocolate cream. Lemon mousse is my current favorite!! Butterscotch is my favorite pudding, with lemon a close second. Chocolate mousse, butterscotch pudding. I’m fine with being weird. If there was a way to have cookie dough-flavored pudding/mousse…that would be my favorite HANDS DOWN. Being an Aussie a pavlova is one of my favs! Chocolate and coconut mousse is my favourite, but really any mousse as long as it is rich and smooth. My favorite flavor of pudding is chocolate!! Anything chocolate, with coconut also- even better! I believe that my favorite flavor of pudding is butterscotch. Although coconut sounds pretty enticing too. Butterscotch! I didn’t realize it until last month when my daughter had her wisdom teeth pulled and had to live on pudding for several days. My husband went shopping and came home with a variety, including butterscotch. Not one to let my daughter eat alone, I tried it and LOVED it!! !